Good Question. What am I doing with my Life is probably not the best question to be asking a search engine. Or maybe it is. Many experts who discuss the topic of life have stated the same basic concept in many ways, but this is what I learned from Stephen R Covey: Begin with the end in mind. “Habit 2”. You don’t need a detailed plan, but know where you want to end up. Make it real. Instead of saying, “I want to be rich” say “I want to have $2,788,007.00 in the bank by the time I’m 30”. Set an anchor that everything else can tether to. Nicco knows all about this. Nicco is a dog that I dog-sit from time to time. He’s a spunky little guy, and no one loves him more than his family. Nicco is loved. And, he’s smart! He knows all about the concept of knowing where you are going in life, and he proves it every time we go for a walk. One day while Nicco was staying with me, he perfectly represented the difference between knowing where you are going and not knowing. There is a sidewalk that runs along the water and it has several good walks you can take. Some involve seascapes and views of Long Island Sound and others have hidden staircases of 60+ steps. It’s kind of cool. One destination is the cove where the horseshoe crabs hang out. During Nicco’s stay, I latched on his leash and we headed out towards the horseshoe crabs. Nicco herked and jerked at the end of his leash. He stammered and started, over and over. He zigged and zagged, and frequently walked in circles. It was a confusing journey for everyone involved. Finally, we arrived at the cove. I lingered a while, listening to the waves and looking out over the water, towards the harbor. The sun was setting and it was quite spectacular. Nicco sniffed and snooped around the small concrete landing at the water’s edge. He ate something he probably shouldn’t have, but he was so fast it was gone before I could wrestle it from his tiny mouth. He gazed at me, triumphantly. After a few minutes, I turned and headed back towards the house. Nicco morphed into an aggressive sled dog! I could barely hang on to his leash as all four and a half pounds of fluffy dog determination lurched forward. He dug in his paws and I could hear his nails scratching against the sidewalk with all his might. “Now, he knows where he’s going,” I thought. Nicco never slowed or broke his stride until we reached the front door of the house. Panting and happy to have reached his destination, he gulped down some water and took his place on the arm of the sofa where he could see out the window. Life is like this. If you don’t have a few markers or a general sense of where you want to end up, you are like Nicco when he has no idea where we are going. Aimless. Confused. Walking in circles. You can always make adjustments as you move along, but begin by choosing a destination that serves you well. 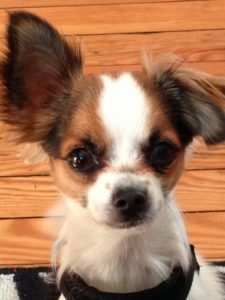 Thank you for reading, and even if you don’t like small dogs you have to admit that Nicco is pretty darn cute. Learn more about the Habits, and Stephen R Covey, here.